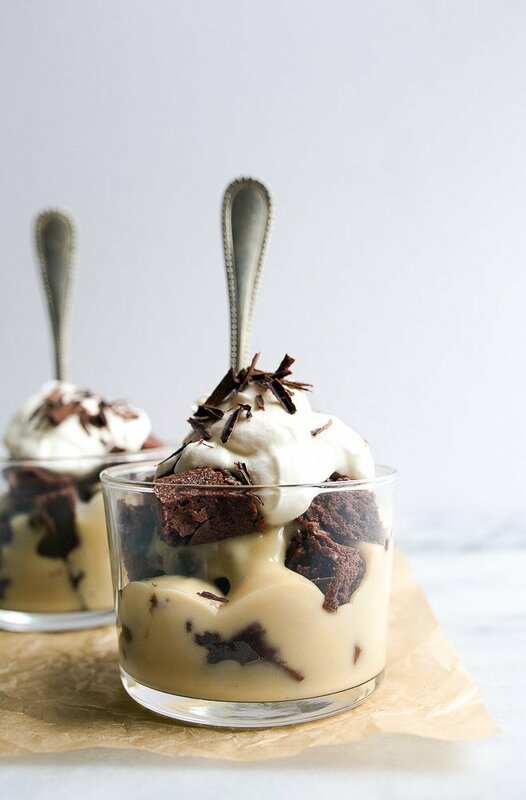 Brownie trifle for two with Irish Cream pudding, whipped cream and chocolate shavings. 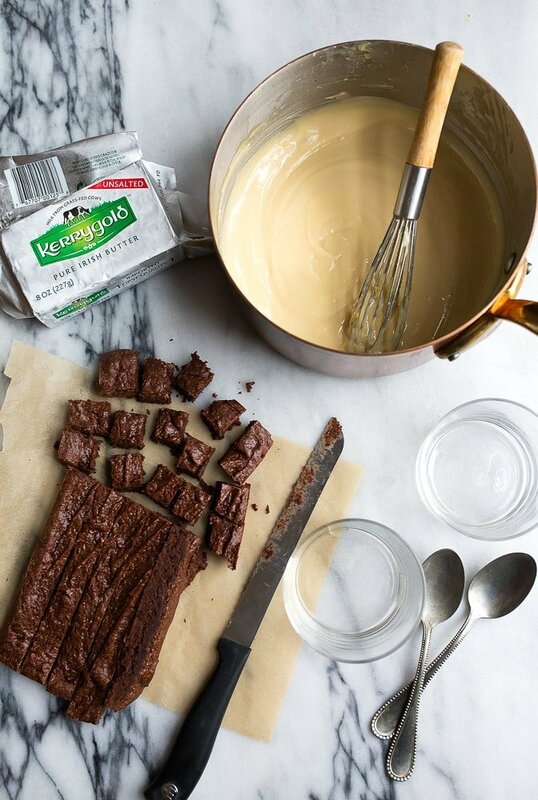 This recipe is lovingly sponsored by Kerrygold, makers of my favorite ingredients when baking! I have zero regrets about this brownie trifle with Irish Cream. As you guys know, I’ve got a deep love for Kerrygold products. I started blogging in 2010 and that same year, we started working together. The past 7 years have been so wonderfully buttery and cheesy. And then, Kerrygold did a thing. They started making Irish Cream Liqueur with their grass-fed dairy and real chocolate! It was like I didn’t know my life could get any better, and then IT DID. After letting the brownies cool completely, chop them into cubes (resist the urge to use a heart-shaped cutter…it’s hard, I know). 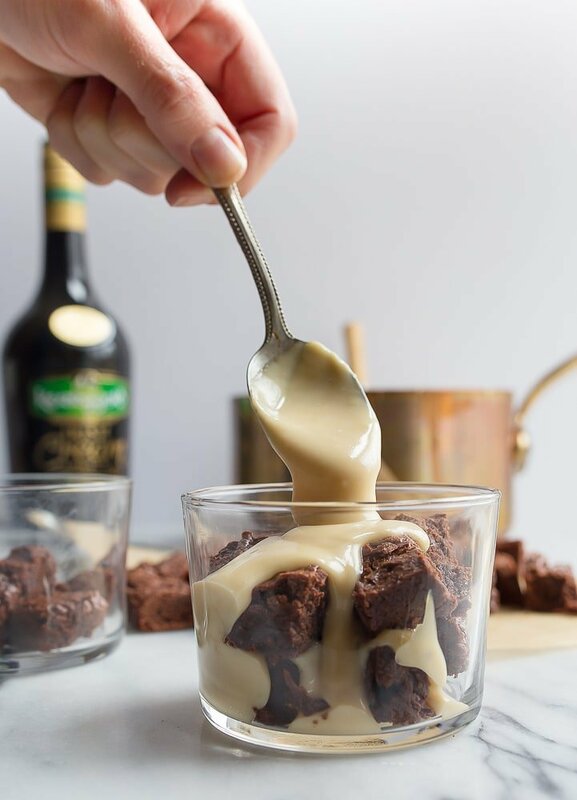 Make a small batch of vanilla pudding, but leave out the vanilla–Kerrygold Irish Cream Liqueur is going to bring all the flavor we need. 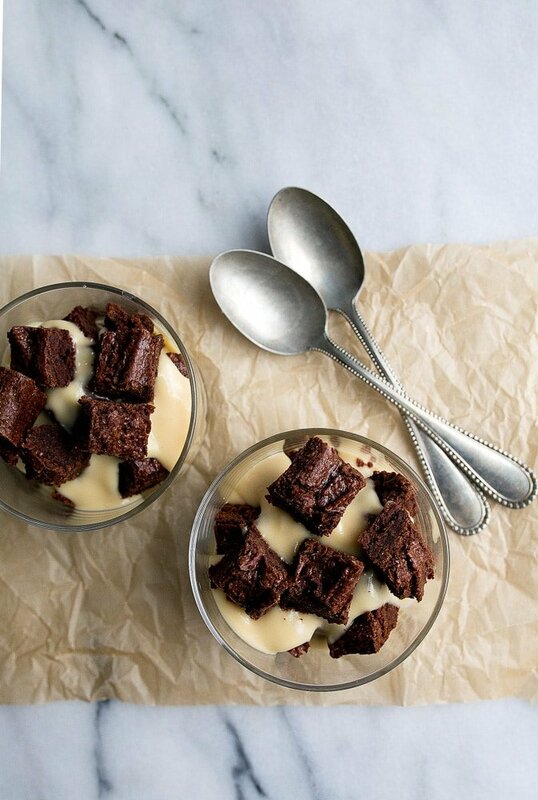 Finally, layer the brownie cubes and pudding in two small dishes. These are actually water glasses, and I love them. Let the brownie trifle sit in the fridge for a few hours (up to overnight). Before serving, whip some cream with powdered sugar. 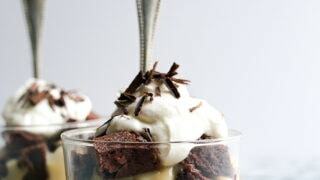 A little dollop of whipped cream (and chocolate shavings) on top of each brownie trifle brings so much to the party. And the good news is, with the rest of the bottle of Irish Cream Liqueur, you can have a brunch party this weekend! 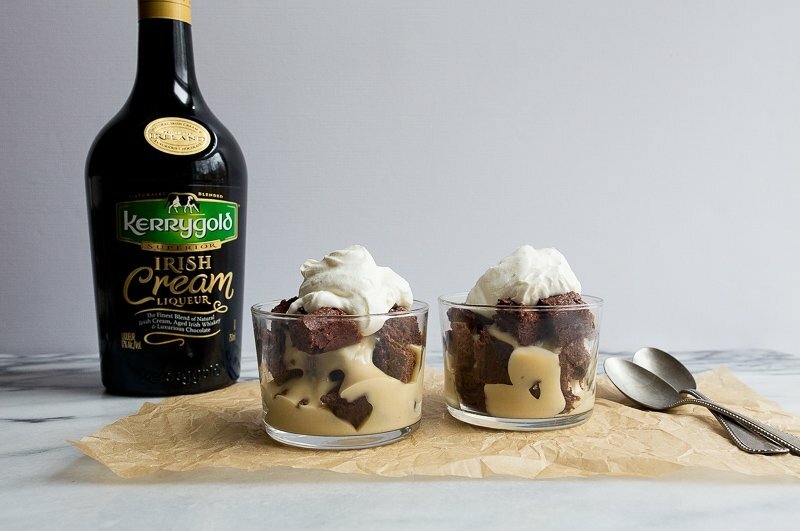 Irish cream brownie trifles for two. Valentine's Day dessert for two. Preheat the oven to 325, and line a 9 x 5-inch loaf pan with parchment paper. In a microwave-safe bowl, combine the butter, sugar and cocoa powder. Microwave for 30 seconds on HIGH. Stir, and microwave for another 30 seconds on HIGH. Stir the mixture very well, and then add the salt and vanilla. Stir for 1 minute to cool the mixture. Next, add in the egg, and stir until its incorporated. Finally, add the flour, and stir for 50 strokes! Spread the batter into the prepared pan. Bake for 23 minutes, or until a toothpick inserted comes out with fudge crumbs clinging to it. The surface of the brownies is shiny when done and starting to crack. Let cool completely in the pan, and then lift out using the parchment paper. Chop into 1/2" cubes when cool. Set aside. Next, make the pudding: whisk together the sugar, cornstarch and salt in the bottom of a 2-quart saucepan. Slowly add the milk and egg yolk while whisking. Turn the heat on the pan, and bring it up to a gentle simmer, while constantly whisking. Be sure to scrape the edges of the pan frequently to prevent lumps. Whisking vigorously will break up any lumps. Remove the pudding from the heat when it thickens (and coats the back of a spoon), and stir in the Irish Cream Liqueur and butter. Stir until melted. Cover the trifles and refrigerate for at least 4 hours, or overnight. Before serving, whip the heavy cream and powdered sugar together in a bowl with a hand mixer on HIGH until soft peaks form. Dollop each trifle with whipped cream, sprinkle with chocolate shavings and serve. Oh dear! Oh dear ! Thank you and have a pleasant day ! Have you ever tried bourbon in brownies? My favourite! Christina – this looks simply amazing! I am headed out to buy everything I need to make these for St. Patty’s day! And who doesn’t love irish creme? YUM!